The Sox also have interest in Kenshin Kawakami, a 33-year-old righty for the Chunichi Dragons who went 9-5 with a 2.30 ERA last season. Kawakami is a Hiroki Kuroda-type pitcher with a cut fastball and good curveball who could man the No. 4 or 5 spot in the Sox rotation. I normally interpret the comparison to Hiroki Kuroda as “not as good as Daisuke Matsuzaka, but better than Kei Igawa“. In addition to that, they’re both right-handed, about the same age, and have long track records of success in Japan’s Central League. 1. Kuroda is a fastball/slider/splitter pitcher, while Kawakami is mostly a fastball/cutter/curveball guy. Kuroda can reach the mid-90’s on his heater, while Kawakami sits in the low-90’s and relies a little more on movement and off-speed stuff. 2. Kawakami has spent his career with a usually competitive Chunichi Dragons team, while Kuroda spent his career with the perennial also-ran Hiroshima Carp. Kawakami has had a consistently outstanding infield defense behind him for his NPB career, while I don’t think the same can be said of the Carp defense. Kawakami has also pitched in more big games. 3. Kuroda pitched his home games in Japan at the tiny Hiroshima Municipal Stadium, while Kawakami enjoyed the much larger dimensions of the Nagoya Dome. With the above three points noted, I’d say that Kawakami is a slightly worse MLB prospect than Kuroda was last year, but let’s test that assumption with some performance data. This will be a simplistic analysis, but hopefully it will provide a better insight into Kawakami as a prospect. Using stats from the excellent Data League site (Japanese, works best in Internet Explorer), I put together some simple comparisons to try to isolate the differences between the two pitchers. I looked at the period between 1998-2007, tossing out Kuroda’s 1997 because Kawakami hadn’t started his career yet and 2008 because the two pitchers were in different leagues. Kuroda’s DIPSera was pretty consistent his last few years in Japan, but his actual ERA varied widely, which is probably the result of an inconsistent defense. Kawakami, on the other hand, has put up consistent DIPSera and ERA numbers. This one surprised me. 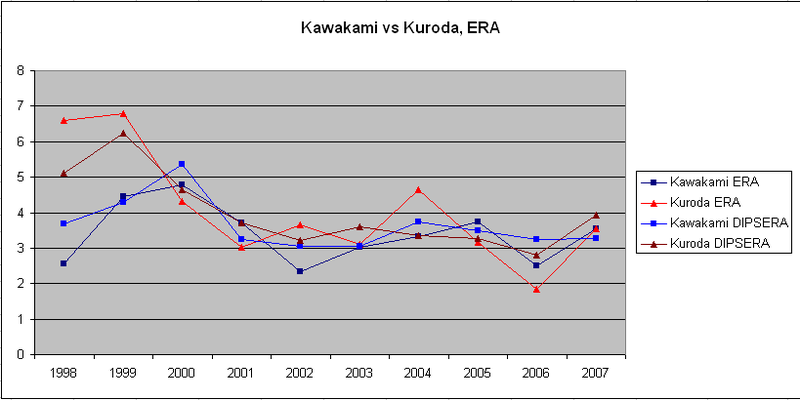 Kawakami matched Kuroda on strikeout rate consistently in Japan, and bested him in ’06 and ’07. Both pitchers have done a good job improving on their control as they gained experience. If anything, this and the previous chart point out that Kuroda was coming off a relatively poor season by his standards in ’07. Kawakami, on the other hand will be coming off a much better 2008 season statistically, though he did miss time due to minor injuries and the Olympics. It’s easy to favor Kuroda as a pitcher because of his stuff (I do), but Kawakami has been a consistent performer over the last eight years. Should Kawakami pursue a career in MLB (and I think he will), his performance will obviously depend on where he winds up. But if he can continue to keep the ball down in the zone and miss bats with his breaking stuff, I see no reason why he can’t be an effective mid-rotation starter.